This simple salad of lightly cooked broccoli and avocado tossed with a a simple vinaigrette makes for an easy healthy vegetarian lunch or satisfying side dish alongside grilled or roasted chicken or fish. The contrasting textures of crunchy broccoli and creamy, soft avocado are a winning combination. 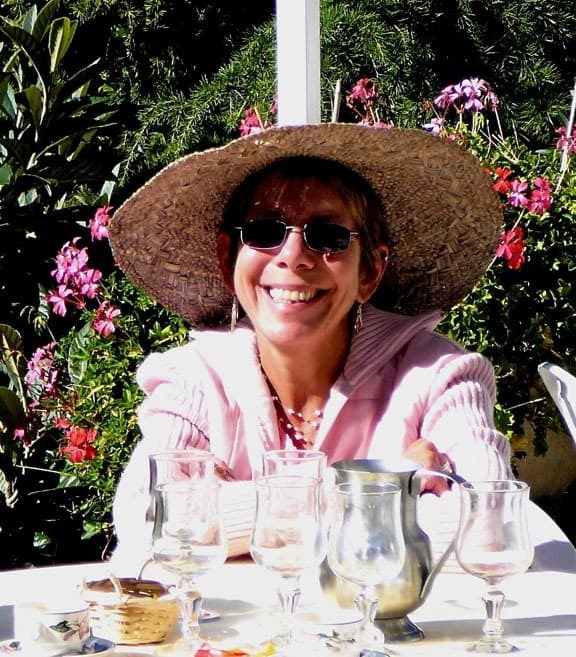 The easy healthy broccoli recipe originates from my home in Provence, France. Avocados there come from as far away as Madagascar and Israel. We’re luckier here in the states with both west and east coasts boasting great avocados that are shipped everywhere in the country. Broccoli is relatively new to French markets. We were shocked and delighted to see it showing up in the produce stalls, marketplaces and supermarkets and quickly developed this recipe which uses the classical French vinaigrette to highlight the strong broccoli and delicate avocado flavors. How Many Calories/WW SmartPoints in this Broccoli Avocado Salad? According to my calculations each serving has 121 calories and *3 WW Freestyle SmartPoints. Back when it was first making its appearance in France, I had to teach a local at the local Tuesday market how to peel the outside stems of the broccoli and steam it until bright green and slightly crunchy. Of course, prepared broccoli flowerets in plastic bags are ubiquitous everywhere in the USA. They are usually just fine when really fresh; the plus side of buying full crowns or broccoli heads though are those tasty, filled with nutrition stems. They can be cut on the diagonal, straight or chopped up and add a wonderful additional texture. The process is so easy! Give it a try if you’ve only used the flowerets in the past. 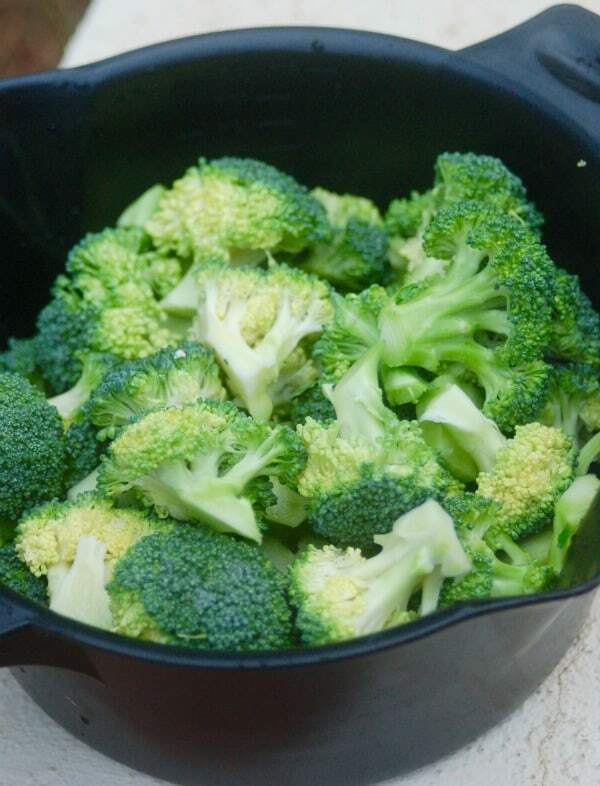 My favorite way to cook broccoli is to steam it in the microwave for 3 to 5 minutes. Herbs de Provence (affiliate link) is a seasoning blend featuring many of the herbs that grow most abundantly in southern France and that correspondingly get used in a lot of the cooking from that region. The blends are typically made from dried herbs and are meant to be an easy short-cut for seasoning dishes. Which herbs get used and their exact ratio depends on the recipe and the cook, but the most basic blends include savory, rosemary, marjoram, and thyme. Though less traditional, lavender buds are sometimes added, as are fennel seeds, sage, tarragon, and even orange zest. These days the spice section of most well stocked grocery stores sell Herbs de Provence (affiliate link). If you prefer you can create a blend yourself: Basic DIY Herbs de Provence Recipe. If you don’t have Herbs de Provence (affiliate link), substitute Italian Seasoning blend. Serve on it’s own with Crusty Bread for a light Vegetarian lunch. Serve alongside roasted or grilled chicken, fish or steak. 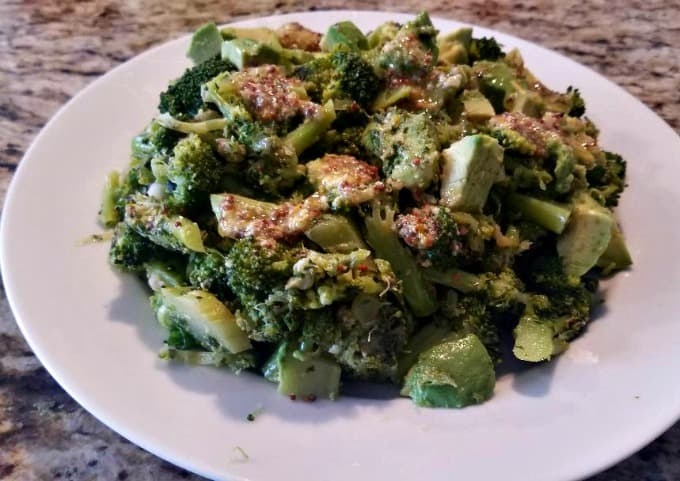 If you’ve made this Broccoli Salad with Avocado, please give the recipe a star rating below and leave a comment letting me know how you liked it. 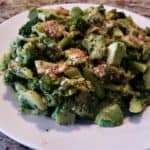 This simple salad of lightly cooked broccoli and avocado tossed with a a simple vinaigrette makes for an easy healthy vegetarian lunch or satisfying side dish alongside grilled or roasted chicken or fish. The contrasting textures of crunchy broccoli and creamy, soft avocado are a winning combination. In a large bowl, whisk together lemon juice, mustard, olive oil and Herbs de Provence. Add the avocado and broccoli and stir gently to thoroughly mix. Taste and season with salt and pepper. Serve immediately or store in the refrigerator for up to 24 hours. Serve this at room temperature. My preferred way to cook broccoli is to steam it in the microwave for 3 to 5 minutes. Herbs de Provence is a seasoning blend featuring many of the herbs that grow most abundantly in southern France. These days the spice section of most well stocked grocery stores sell Herbs de Provence. If you prefer you can create a blend yourself: Basic DIY Herbs de Provence Recipe. Thanks Anne. I appreciate you taking the time to let us know!